Sometimes your brain isn’t entirely engaged when coloring. Or at least that happens to me! ha! So my deer are wearing slightly different outfits than possibly intended. 🙂 Watch the video below or click HERE to see it in HD on YouTube. I love the reindeer vests!!! Thanks so much for the video!! You are the best! Thanks for the opportunity to win! I think I am too late to win the set but I just wanted to let you know that I love your videos and this card is no exception! LOL! Love the vests :o) Great card! I love the fun of it. What a great card Sandy! These reindeer were so cute. Thanks for sharing, I always love watching and learning new techniques. Hi Sandy! Thank you SO much for your amazing coloring videos! I have become a much more confident colorist since I began watching them & have begun to challenge myself more & more! I’ve eve gone do far as to draw my own backgrounds a couple of times! I really appreciate how much detail got go into an all of the little tips & tricks you share! Thank you for this opportunity to win such a super cute stamp set, even if it was by happy accident! Happy Holidays! I like how you think. I have learn so much from your videos. Happy Holidays. Thank you for sharing … love this card! I will definitely be checking my pencils now. I bought a pack of distressed pencils a while back and every time I sharpened them, they just kept crumbling. I know why now. Thanks for the chance to win the stamp set. It is adorable! Love love the deer in vests! Would love the set! I love the reason why your reindeer are wearing vests! It wouldn’t have occurred to me that they would be dressed in anything else! I absolutely love your reindeer vest story! The reindeer are just in fashion with their little vests. I’m always amazed at how you bring everything to life on your cards. Beautiful coloring. Love this adorable card! The reindeer set is so fun! I’ll be keeping my fingers crossed! I am already a subscriber, so I won’t flake out on you if I am lucky enough to win! I love the coloring and think it would make wonderful gift wrap as well. Always love to watch Sandy color no matter the products used. She does a fantastic job and love the detailed stories and comments. Thanks Sandy, love it!!! Love the idea of sprinkling reindeer across the card! These are so adorable and of course, beautiful coloring!! I think you are wonderful and a definite inspiration. I’ve learned so MANY techniques from you! Hope your Thanksgiving was amazing! Adorable reindeer!! Coloring with pencils on kraft is so awesome!! I always love your videos. Hope your Thanksgiving was amazing. Adorable card! Love the vest story! Sounds like something I would do! Thanks for sharing! I thought the card was really cute and the idea of wearing a vest was pretty ingenious! (Had to look up the word to make sure that’s what I meant..whew! It was.) Loved your coloring, as always. Would love this set. Thanks for the chance. Hi Sandy! I love your card and the super cute reindeer,would love the chance to win.I’ve asked before but not had a reply-are your giveaways open to international subbies too please? I keep replying…you’re just not reading them maybe? Yes open to international. This set is so cute! Would love one in my reindeer collection! So cute and you are so thoughtful. Love your expertise!!! adorable–you have totally enabled me on my journey to Desert Storm cardstock–you always make these cards pop!! I like the idea of reindeer vests! Lovely card! I love to see you coloring. The card is so cute. And the bells ringing are a great special effect. 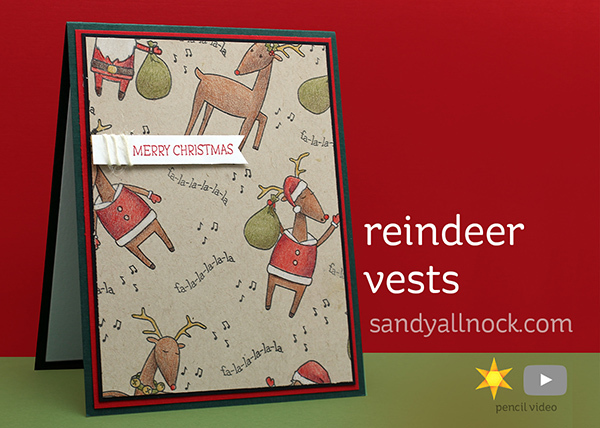 I think you can go either way with these cute reindeer–jackets or vests. Really, Sandy, anything you color is beautiful! Even before I watched the video, you had me chuckling! I adore your sense of humor and your willingness to share your foibles with us. And thanks for explaining why some colored pencils keep “breaking.” I got so frustrated with one set that I finally called the company and complained. They replaced the set for me, but didn’t explain that the breakage could have taken place during shipping. Have a happy holiday season and let the bells ring during voice overs – it adds to the joy of watching you create. I think a reindeer wearing a vest is perfectly natural enables then to move around more freely!